Since that speech, the Bank of Japan raised its QQE component to ¥80 trillion yen annually and now has implemented a tiered negative interest rate regime. Household spending for December 2015, the latest figures released, fell by 4.4% in real terms year-over-year; -4.2% nominally. That was practically the same level that shocked economists almost two years ago and yet Japan is still facing the same economic hole, only extensively widened. There was no tax hike to blame nor even “inflation” itself as despite all proclamations issued over the intervening twenty months the calculated “inflation” rate is practically zero once again. All that is left is the admissions for absolute failure of the entire project, which arouses nothing of suspicion in the media or mainstream. 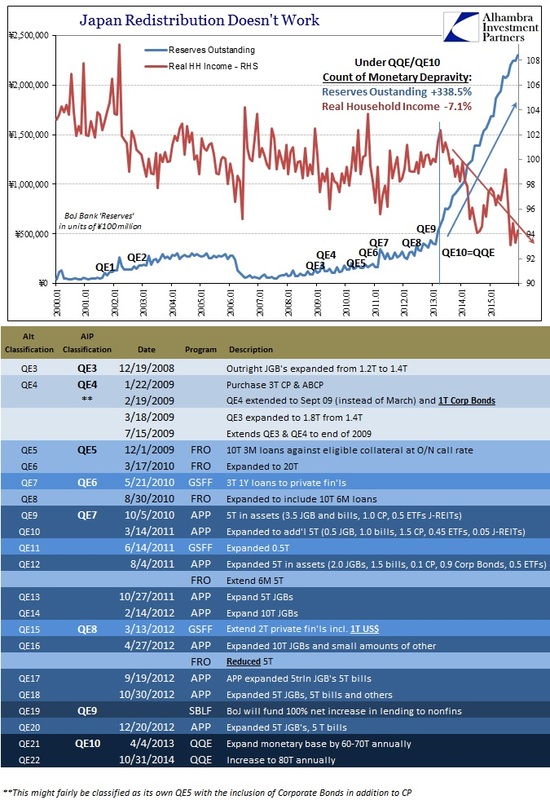 Instead, negative interest rates are treated, at least initially, as some kind of hope as if any different than the undeniably massive QQE that was perpetrated upon the poor Japanese people. The scorecard registers a full knock-out; the Bank of Japan under QQE/QE10 has increased the level of bank reserves by +339% since March 2013; total real household income over that same period is -7.1%. A few percent in decline is a disaster; -7.1% skews beyond written description. And that isn’t the worst of it as the true cost is measured not just in declining national income or spending but in the time period rendered useless (lost compounding is the greatest cost). 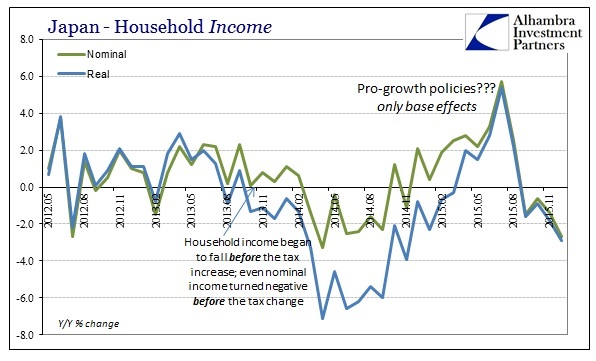 Time and time again (pun intended), economists tell us that there needs to be this kind of negative factor or negative redistribution effects “necessary” to complete the recovery agenda. QQE was started in April 2013, only a few months shy of three years ago. The yen started depreciating in October 2012. With monetarism there is no “transitory” only the desperate wake of economic destruction. The Japanese economy has only grown poorer for which Japanese households have paid for with their own poverty. In other words, the true foundation of their economy has been rapidly undermined by the intensive monetarism, a relationship that bears out repeatedly. BoJ officials and economists keep saying that businesses will respond via inflation expectations by offering more wage gains. And in some cases they appear to; “special cash earnings” jumped by 25.2% in May 2015 and 18.2% last October. Those months, however, are limited in their wage impacts. The key months for Japanese income are June and December (more the latter). Special cash earnings fell 6.7% in June 2015 and were down 0.4% in December. That means real wages in the all-important December month for 2015 were 2.8% less than December 2013 and 4.1% less than December 2012. Meanwhile, the Ministry of Finance estimates that total labor expended in Japan continues to sink. Total hours worked declined again in December for the fourth straight month; non-scheduled aggregate hours worked, overtime essentially, has fallen for eleven consecutive months dating back to last January. Economists say of Japan (as the US) that this is demographics but the transition could not be clearer. The population did not suddenly start to decline in October 2012 when the yen started to. Labor utilization seems to have hit a persistent downdraft starting right at that point entirely different than even the years before and after the tsunami. 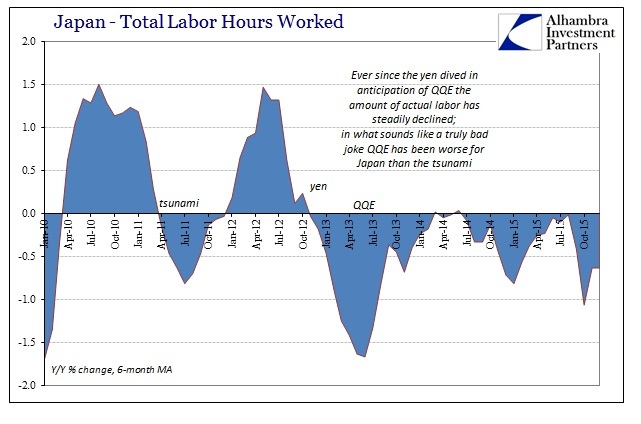 In other words, QQE has left a permanent scar upon the Japanese economy, in its very foundation, far worse than anything unleashed by Mother Nature. 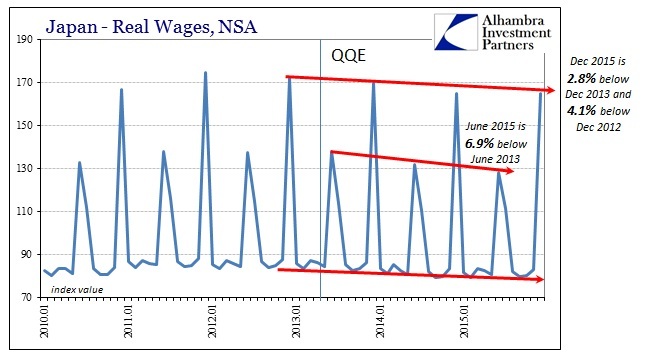 Again, this experiment has run almost three full years and there is only more evidence of further alarming decline balanced against absolutely nothing that would suggest central banks have any idea what they are doing. They stick to the script of expectations regardless of how little it actually happens. Not even “inflation” has cooperated even though the yen has; which, in the twisted sense of monetarism is actually a very small blessing for the Japanese people. 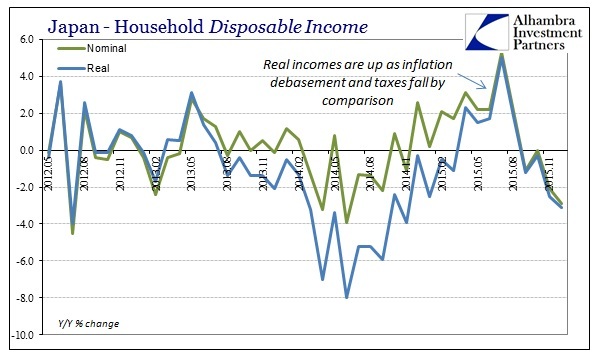 It bears repeating: in December 2015 nominal household spending in Japan fell by 4.2%; nominal income by 2.7%. 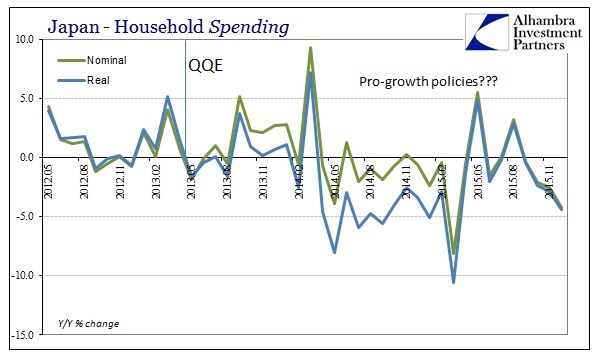 Neither of those declines is out of line for the Japanese economy after nearly three years of negative redistribution. Is it any wonder BoJ and central bankers want to try something else, not something actually different just something, anything that might be free of this negative and harmful association? The BoJ has increased the level of “base money” in Japan by ¥184 trillion (thru the end of January 2016) via QQE/QE10 in what was supposed to by sheer size alone leave no doubt of its power and vigor. There are no doubts, anymore, which is precisely Kuroda’s problem. Recovery in Japan starts when it no longer is.